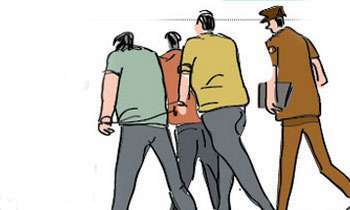 The Negombo Division Crime Investigation Unit said that they had arrested a gang of three who had robbed a sum of Rs.170,000 from a rich businessman after asking him to donate money to help save the life of a cancer patient. A motor cycle used by the gang to commit the crime had been taken into custody. The gang members, aged between 32 and 36 were said to be drug addicts. The victim was said to be a wealthy businessman identified as Sekaram, a resident of Pallanchena in Kochchikade, who informed the police that his purse with Rs. 170,000 in it had been snatched by the gang when he opened it to hand them some money. OIC, Chief Inspector Sampath Dissanayake had received the call and had arrived at the home of the businessman along with a police team and had managed to track down the culprits said to be residents of Lurdu and Fathima in the Kochchikade Police Division.